Okay, here’s the deal: There are many business accounting and billing products out there, and, sure, we’d love for you to check out ZipBooks. But we want you to find what’s best for your business. We’re here to help! So, here’s Xero vs Quickbooks: an honest review of two of our competitors, their major features and pricing, and how they compare to ZipBooks features and pricing. 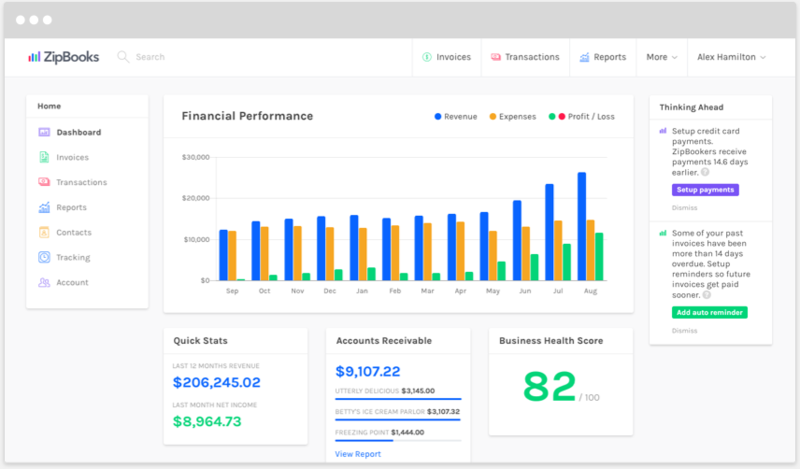 Quickbooks Online (QBO) is a personal and business bookkeeping software developed by Intuit in the early 2000s to help small businesses with their bookkeeping systems. QuickBooks is big particularly in the U.S. and Canada. Xero Limited was created in 2006 in New Zealand, with a focus on cloud-based business accounting software. Xero holds the highest market share in Australia, New Zealand, and the UK. Both are cloud-based accounting applications, meaning you can access your files anywhere there’s an internet connection. They both cater to small and mid-size businesses and offer common tools and features that companies look for in accounting software. But there are differences that could sway people one way or the other. Generally, preferences may arise because of the type or location of a business. Ultimately it’s up to you, the business owner, to decide what’s best for you. So let’s jump into the details! As a note: QuickBooks does offer desktop alternatives like QuickBooks for Mac or QuickBooks Enterprise, but for the sake of cloud-based comparison, we’ll only be addressing QuickBooks Online in this post. 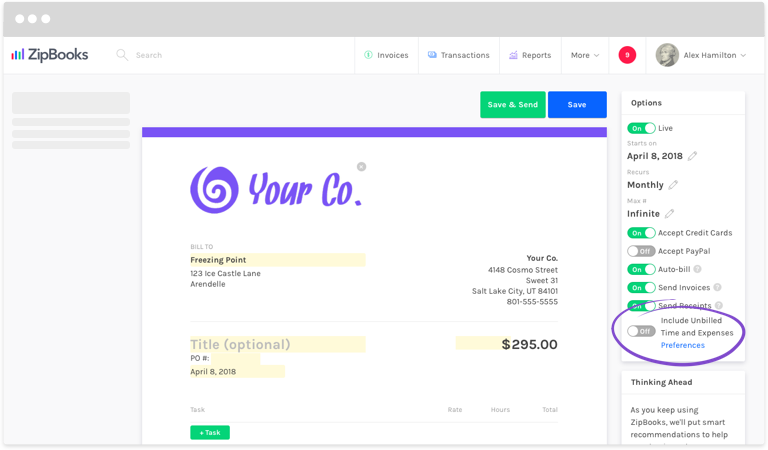 Both Xero and QBO let you customize invoices, add your preferred colors and logo, and change up what a customer sees on their invoice. 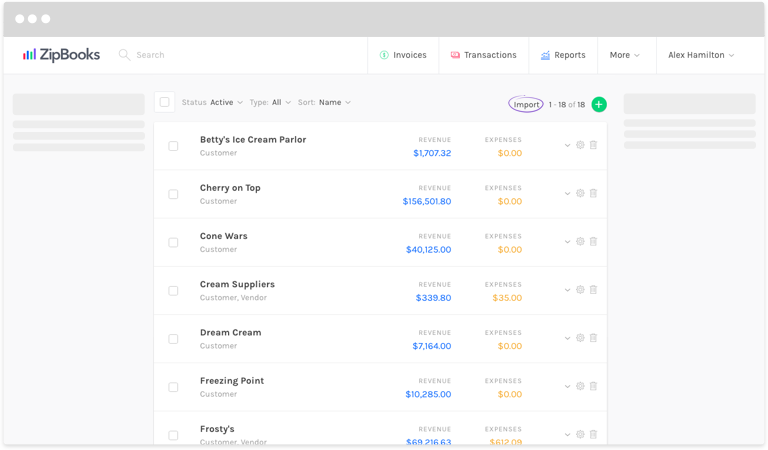 While QBO has an interface that seems to be a little more intuitive and easier to follow, Xero offers more customization in the area of what you can add to or omit from your invoices. Also, Xero allows you to apply a certain invoice template to a customer, so that all invoices that go to that customer have the same format. With QBO, you may keep or change the format for all invoices, or choose a different template for each individual invoice. Both Xero and QBO allow you to save frequently invoiced line items along with their prices and descriptions, to save you time. Both let you set up email reminders to prompt customers to pay their invoices on time (or to just pay, period, as the case may be!). Both offer customer statements that include transactions, payment history, and outstanding balances, though the QBO edition includes an aging table. Both apps let customers pay right from the invoice, if you’re set up to receive payments. QBO uses their own proprietary credit card payment collection system, while Xero integrates with 27 payment apps like Stripe, or Square. If your customer opts to pay by bank transfer (ACH), QBO charges you no fee, while Xero charges $1 per transfer. Xero and QBO both have the option of creating recurring invoices and sending them automatically, though receiving payment automatically with Xero seems to be more complicated than with QBO. One advantage that Xero has over QBO in the invoicing department is the ability to create contact groups, and then send one invoice to everyone in that group. We like potential time savings! On the other hand, QBO lets you automatically pull unbilled expenses onto your invoices, and Xero doesn’t offer that capability quite yet. ZipBooks gives you unlimited invoicing and customers right from the start, with fully customizable invoices, colors, and logo upload. 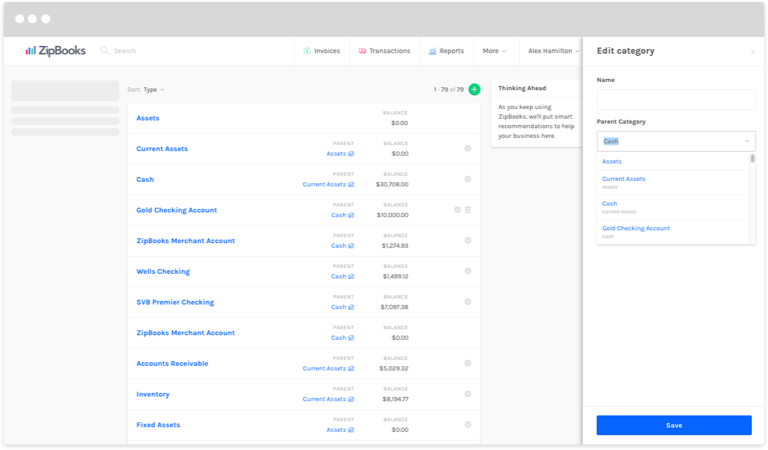 Save common line items for use on future invoices, send reminders to keep on top of outstanding balances, and let your customers pay right from their invoices in a snap. Automatically include unbilled time and expenses on your invoices, and set up recurring invoices and auto-bill for quick and easy collections. Both Xero and QBO offer automatic transaction feeds when you connect to your bank. As for how reliable the feeds are, you may want to test out both to see which is most prompt and accurate. Both services allow you to import bank transactions by CSV as well, should you need to go that route, and both have auto-categorization capabilities, though the accuracy of each is another thing you’d need to decide for yourself after trying them out. Both apps let you match transactions created in-app to transactions in your automatic bank feed. One possibly-significant difference is that in Xero, once you match transactions, they’re considered reconciled. In QBO you can match transactions, but they’re not reconciled until you run a reconciliation as a whole. The processes are technically very similar because in order to make sure you’re good in Xero, you need to check your numbers in the Bank Reconciliation Summary. So, maybe no big deal? But everyone’s got a preference. Also, in both applications, you’ll be given a list of possible transaction matches in case the program incorrectly matches something for you. Then you can just choose the right one(s) from the list and move on with your life! With ZipBooks you can connect to your bank so your transactions come in automatically, and if you need to import by CSV, we’ve got you covered. Match transactions, see which are confirmed or unconfirmed at a glance, and reconcile seamlessly. ZipBooks saves you time by learning from your actions and automatically categorizing your transactions. Our machine learning algorithm gives you an accuracy percentage on auto-categorizations to show you how confident we are that it’s in the correct place. If it’s not, simply choose the right category, and ZipBooks will learn for next time! Both have a customizable chart of accounts, and journal entry capabilities, and both allow you to import a chart of accounts. But Xero doesn’t let you set up sub-accounts in your chart of accounts. For example, if you have a category called Telephone Expense, in QBO you could set up multiple sub-accounts of Telephone Expense called Cell Phone and Landline. Though in Xero it may be possible to use the tracking function to create those groups and add expenses to them. ZipBooks lets you add to and customize your chart of accounts (though we call this Categories because we’re all about non-intimidation of non-accountants). We give you a list of already set up categories, and you can add more as needed, including subcategories to your heart’s content! Speaking of tracking, both Xero and QBO have a way to track things like multiple store locations, product lines, or sales channels. In Xero it’s called Tracking, and in QBO it’s called Class Tracking or Location Tracking. 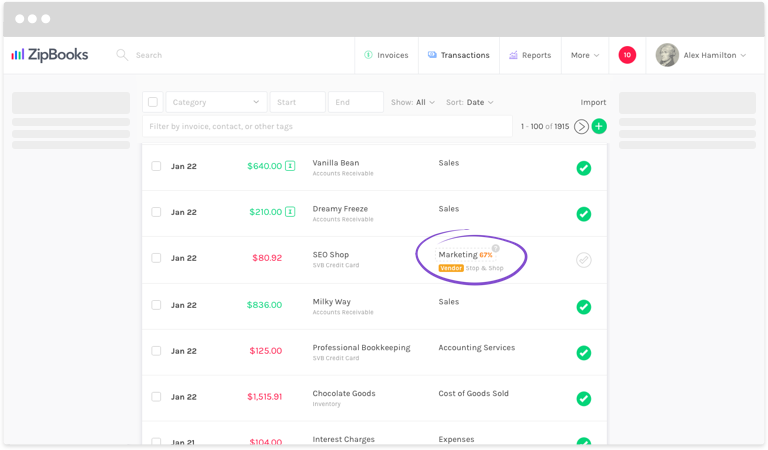 One difference is that in Xero you can only have two active tracking categories at a time (location, sales channel, etc), though you can have up to 100 tracking options per tracking category (Houston, LA, New York, etc.). With ZipBooks you can create unlimited tracking categories (though we call this Tagging). You can tag by location, sales channels, product line, customer, vendor, project, 1099 worker, and on and on. Then you can create reports based on only the tags you need to see. Pretty convenient! Both Xero and QBO have report centers where you can generate the reports and statements you need to see how your business is doing. Both have a considerable range of different types, as well as the capacity to customize reports based on what you need to see. One difference we noticed is that with Xero, when you generate a report to compare numbers historically (like, say, a Balance sheet comparing numbers from each month of 2017), the most recent month is listed first and then it goes backward. QBO is exactly the opposite. It lists the earliest month first and then moves forward in time. This is a purely preferential thing. Choosing one way over the other isn’t going to derail your business. But some find it more logical to think about moving forward in time, rather than going backward. Especially when it comes to forecasting sales and expenses in the future. Another difference is that Xero doesn’t allow you to group your report by customer or vendor the way QBO does. You can even group by product or service, date created, or amount with QBO. We also noticed that Xero and QBO may, at times, use different methods of reporting. 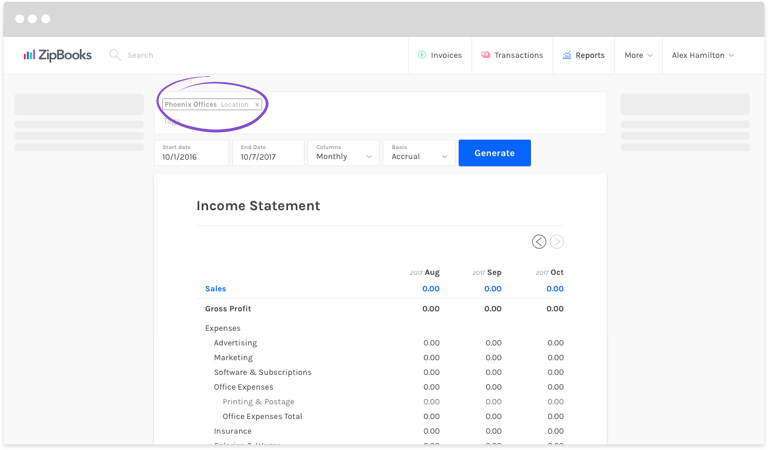 For example, when you generate a Statement of Cash flows in each program, you’ll notice that Xero uses the direct method, while QBO uses the indirect method. Again, this is a matter of preference, and it may not be a big deal to you either way. With QBO you can export reports to PDF or Excel. Xero give you the same options, but also includes exporting to Google Sheets. QBO gives you additional options to email reports right within the application, and add notes to your reports. ZipBooks offers a full range of customizable financial, accounting, sales, expense, and even team reports that you can export or print as PDFs. Results are displayed in a beautiful and intuitive way, grouped how you need it, (whether by category, customer, vendor, or time) so that you can see what’s going on at a glance. Time periods on reports go from earliest first and move forward in time. Plus, you can create reports based on tags so that you can see information for individual locations, product lines, or sales channels. Both Xero and QBO have trackers that let you keep track of the time you spend on certain projects or tasks, individual users, and billable time. One difference is that currently, the QBO time tracker doesn’t work on mobile devices, but you do have the option of integrating with other time-tracking apps. ZipBooks has a convenient time tracker that you can use on your desktop, or on the go. Set the project and task you’re working on and let it run in the background. Make changes to time entries later if you forget to set or stop a timer, and mark time entries as billable to customers so you’re sure to get paid for every minute. Both QBO and Xero let you import customer or vendor lists to save you time if you’re switching accounting programs. QBO also lets you add sub-customers that are listed under a parent customer, if you have, for example, bills that you send to different departments of one particular company. Xero lets you store a whole lot more information about each contact. For example, you can add common info, like name, address, and phone number, but you can also store info like tax ID numbers, default customer discount and currency settings, and invoice theme and recurring due dates. ZipBooks keeps all your contacts in one convenient location. Filter your list to see customers, vendors, or only active or archived contacts. When you click on a contact, you’ll see not only all their general information, but also how much revenue you’ve generated from a customer, how much you’ve spent on a certain vendor, a list of people you communicate with at that company, and any invoices, estimates, and recurring profiles that are connected to each. If you have a question that you can’t find the answer to in their help site, QBO has a messaging option you can use any time of day, or you can call them during business hours Monday-Saturday. Messaging might be the best way to go, though, as wait times can be long. Xero lets you fill out a help request form, and then they contact you by email after they’ve received your request. It can be a little hard to find this form initially, but you can search for it in the help section. At ZipBooks, we’re always here for you. We have a fantastic knowledge base full of answers to questions from “How do I set up my account?” to “What is a contribution margin?” If you don’t find what you’re looking for, start a conversation with a ZipBooks expert right from your dashboard at any time. Our team is prompt, knowledgeable and courteous. We know how to treat our ZipBookers! Ok, now we’ve reached one of the most important aspects: How much does it cost? As you would probably expect, both programs have multiple subscription levels that include different features and capabilities. They both offer free 30-day trials, and while Xero appears to be the cheaper option on the starter level, features are pretty limited. However, Xero does offer some level of employee payroll as part of two of their plans, while any level of payroll on QBO is an add-on. ZipBooks offers a completely free starter level that includes unlimited invoicing and bookkeeping, and 1 bank connection. We also include our Business Health Score, and Invoice Quality Scores to help you figure out where you could be upping your game to make business better. While payroll is an add-on, we partner with Gusto to give you the tools you need at a great price. Need a whole lot of help with your bookkeeping? ZipBooks can even take it over for you if that’s what you’re looking for. PHEW! Did we miss anything? Yes, I’m sure we did. But hopefully this has started to give you a good idea of which accounting software might be the best for your business. Take advantage of the 30 day trials to go into deeper detail on each one. And if you find that ZipBooks is the one for you, we’re honored to invite you into our family!